I don't know if paradise exists, but I do know that if it does, then it smells like orange blossoms. Orange blossoms, like lemon blossoms, have a unique, ethereal scent: it's intoxicatingly sweet like the smell of a newborn babe and clean and fresh like a crisp spring day. It's feminine. Romantic. Beautiful. It's paradise. Many parts of Southern California are currently ripe with the fragrance of orange blossoms; equally exciting is the fruit itself. Right now navel, Valencia, and blood oranges are widely available. So if you find yourself in Southern California any time between now and June, hop in a car and explore some back country roads where you'll find orange, lemon, and grapefruit groves alongside avocado groves and strawberry farms. The last couple of weekends Jeff and I have visited numerous San Diego regions that are bursting with deliciously ripe fruit trees. Since I got shooed away by a grumpy farm worker at this gorgeous grove on the way to Idyllwild, I couldn't get an up-close shot of the blossoms. So I'd recommend gazing at this beauty on Flickr. Although oranges are wonderful eaten plain out of hand, they are remarkably versatile. I love them in salads, salsas, smoothies, muffins, and cakes. 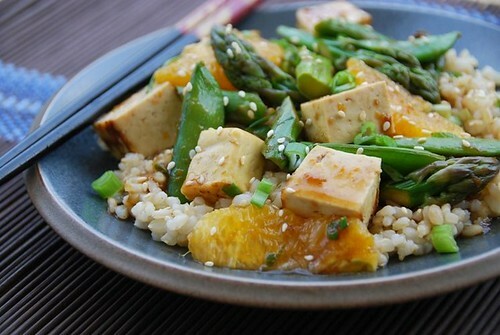 Today I'm sharing one of my favorite meals: stir-fried tofu, asparagus, sugar snap peas, and orange slices bathed in a honey-orange-ginger glaze on brown rice. It's one of those "healthy" dishes -- high in vitamins A and C, fiber, and protein-- that tastes so good, you forget it's good for you. Paradise. In a large skillet over medium-high heat, warm 2 teaspoons sesame oil. Once hot, add tofu and saute until browned and crisp, about 5-7 minutes. Set aside. Meanwhile, bring a medium pot of water to a boil. Cook asparagus and sugar snap peas for 2 minutes. Drain and rinse under cold water. Set aside. To make the glaze, in a small saucepan over low heat, whisk all ingredients from orange juice to corn starch. As soon as it begins to thicken, it's done. In the skillet with the cooked tofu, add the asparagus, sugar snap peas, glaze, orange slices, and herbs. Toss until well coated. Serve on top of cooked organic brown rice; garnish with toasted sesame seeds, and, if desired, fresh herbs and scallions. Serve hot, at room temperature, or lightly chilled. This makes excellent left-overs for tomorrow's lunch. Such a beautiful place... That dish looks delightful! Awesome Post! I just want to say that I love your blog. I hope you don't mine that I follow your blog. Ha ha i was imagine the sight when the farmers were booeing you away. Pity your charm didn't work like that last time with the window cleaners next to your home. Salade looks so so yummy delicious. Beautiful nutritious and healthy meal. 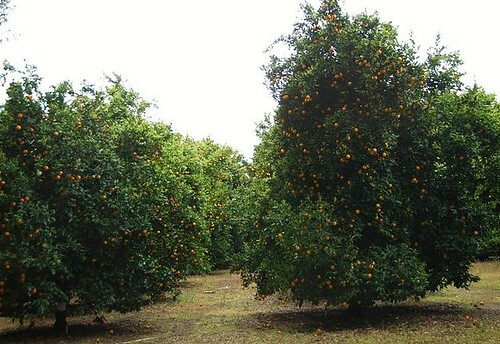 I would love to have access to fresh oranges. It makes me think of trips to Disney World as a child...driving through the orange groves and stopping at the orange tower and buying a tiny bottle of orange blossom perfume. I don't know if they have that in Cali, but I can still smell it. This recipe looks delicious. snooky-It was a beautiful ride. madeline-Welcome! Thank you for the kinds words. happy cook-I guess I can't charm my way through everything. ;) Good memory! karen-No worries. It's not for everyone. You could try chicken instead. rebekka-I never knew about the orange blossom perfume. It must have been so lovely. This looks so good and the flavor would be amazing with those ingredients! I adore tofu (it's been an acquired taste)--this dish sounds wonderful! And those blossoms sound heavenly. I want to fly down to So.Cal. right now just to smell the orange blossoms. That grove is just beautiful. I adore oranges, and I love how versatile they are. Case and point: your wonderful tofu and veggies with orange. Delicious!! I'm definitely trying your orange glaze, it looks and sounds wonderful. I can imagine putting it on all kinds of things (fish maybe?). I love the smell of orange and have several "Peeled Naval Orange" candles sitting in various places around my house. The smell is divine! Great post -- thank you. What beautiful photos, and I can only imagine the amazing fragrance. The recipe looks amazing too! I make a similar glaze for chicken. Your stir-fry sounds terrific. 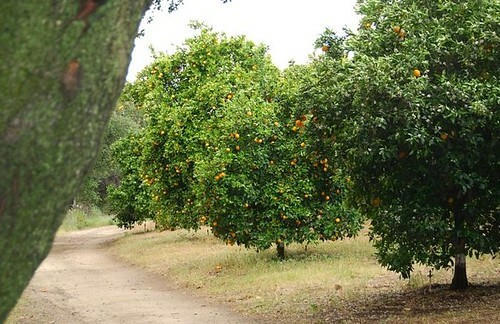 My mother used to live in Ojai, when I would visit I would go jogging in the orange groves, it was fantastic! When I lived in Phoenix, and there was actually orange grooves there, I could smell the lovely scent of orange blossoms. I think it is the best scent I have ever smelled. really. I miss it so. thanks for that wonderful glimpse of spring. Orange & Lemon Blossom is indeed paradise.we used to have lemon tree at home, & the flowers were fragrant beyond description. Every evening i would just close my eyes & soak it up. that is such a nice place to visit!! Fantastic recipe! i love orange in my food.. any time. ooooh. that glaze sounds amazing! Mmmmmmm, that looks good Susan! If paradise doesn't smell like orange blossoms, then it must smell like lemon blossoms. Such a lovely aroma. I have never smelled orange blossoms before. After reading this, I feel as if I have! gfff-Oh, I've gotta get one of those candles. lorlynn-It's wonderful on chicken too. Ojai is so peaceful; I love it there. heather-It's one of my faves. anonymous-Hope you get to smell them in person some day soon. We used to spend Sundays in the orange groves in Florida when I was a kid, bringing home huge brown paper grocery bags of them all winter long. Beautiful! Your orange-glazed tofu looks fabulous!